OK, they’re not the sexiest fixtures in your home, but outlets are arguably one of the most used. It’s our duty to tell you that there’s more to them than you think! The perfect outlet and placement can mean a world of difference in your day to day life. Even if it’s not a total game-changer, a good outlet will improve the function of your home. It’s something you won’t even realize is working well, until you have one that isn’t. Just ask anyone who’s ever had trouble plugging in two things at once, had to use an appliance at the far end of the kitchen, or needed an extension cord just to reach an outlet. This outlet looks exactly like it sounds: a small panel flips up from a horizontal worktop to provide power at a moment’s notice. When not in use, the outlet is recessed into the counter so only the flat cover is visible. 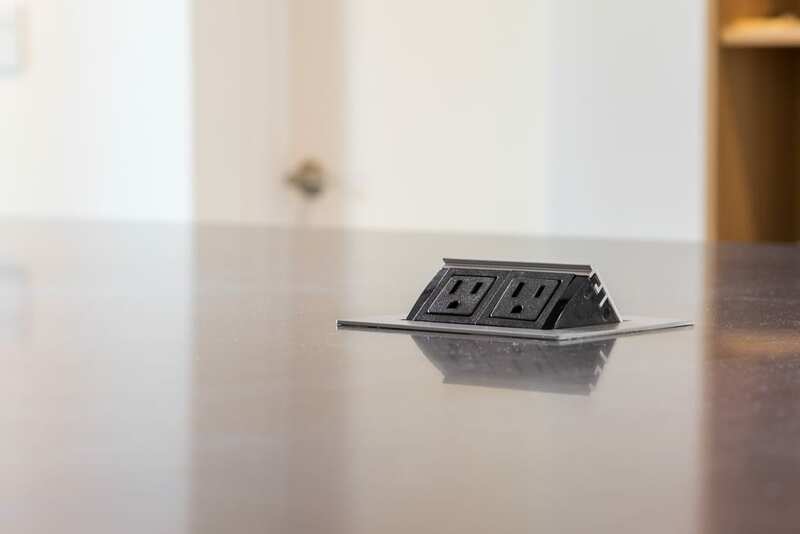 It is a sleek alternative to outlets on the side of a kitchen island and prevents accidental snags on cords that would otherwise be hanging off the side. These outlets can be water-rated, so you don’t have to worry if they’re placed near the sink. Some are spring-loaded, but often they open by pushing a small button on the surface. Similarly, pop-up outlets are great for kitchen islands. Most are spring-loaded and can be opened with a quick push. Instead of being hinged on one side, the pop-up outlet opens vertically and retracts back into the worktop by pressing downward. Pop-up outlets are often dual- or multi-sided, so there’s access to a socket from more than one side. The accessibility, small footprint and multiple angles makes it slightly more versatile than its flip-up sibling. Mounted on a wall, a pop-up outlet has a faceplate just like a traditional outlet, but the sockets are not exposed. A pop-out outlet disappears into the wall with a light push when not needed. Many models fit over existing electrical boxes and are easy to install. They can provide an extra level of security in home with small children, since they aren’t as readily accessible. One of our favorite outlet solutions is under-cabinet outlets in the kitchen. Not only do they keep your beautifully tiled backsplash free out outlet faceplates, but they generally give you more flexibility. Under-cabinet outlets are most commonly achieved by mounting outlet strips under upper cabinets, so they are virtually unnoticeable at eye-level. Since they’re usually strips of 3+ sockets, you can choose where you want to plug something in. Some are angled for even greater accessibility. A more recent phenomenon, flush-mount outlets are rising in popularity because of their minimalistic appearance. The faceplates of these outlets are recessed into the wall, so if you were to run your hand over the outlet you would hardly feel it was there. Some flush-mount outlets, such as the TRUFIG mounting system, come with faceplates that are meant to be painted the same color as the wall or topped with the surface of your choice. Do you ever find yourself trying to plug two things into one outlet, only for one plug to block both sockets? When you’re plugging in items that have oversized plug encasement, a standard faceplate won’t fit two plugs. This is an especially common problem in the bathroom, since many hairdryers and hair styling tools have these larger encasements. The solution is a plus-size outlet, which has the sockets spaced out further away from each other than a standard outlet. They are great solutions for bathrooms and garages, or anywhere else in your home that may require multiple large electric items to be plugged in. You always have the option of choosing a traditional wall outlet, knowing it will never of out of style. Traditional wall outlets actually have two electrical sockets in one unit, though you can find single outlets, too! They can be great for places where you want to make an outlet as unobtrusive as possible, or where you’re certain there will only be one thing plugged in. Really the only thing to think about is if you’ll need a two-pronged or three-pronged socket, though three-pronged is always the safest bet! Two-pronged plugs can fit into a three-pronged socket, but not the other way around. In addition to placement, be sure to consider which type of plugs you’ll be using—it’s never a bad idea to place a few USB outlets in pre-determined places around the home for charging your phone. It’s becoming more and more commonplace to see outlets integrated with a couple USB sockets in places like the kitchen and bedroom. As homes become more integrated with technology, the need for USB outlets is likely to rise. It’s worth the few extra dollars to upgrade to this type of outlet during a remodel. Ask your designer where the best places to put them would be—he or she should be able to point you to the best locations—but it’s your home, so at the end of the day you know what your energy needs are best. Many people see outlet faceplates (the case that surrounds the sockets) as an opportunity to add to the aesthetic of their home. Your local hardware store likely carries a dizzying amount of options, from mirrored to metal to decorative designs. If you’re installing an outlet on a colored backsplash, you may consider a neutral color that matches the trim, or even painting the faceplate to match the tile. Similarly, if you’re installing an outlet in hardwood floors you might look for a wooden faceplate. Just as important as the type of outlet you choose is the placement. Don’t feel limited to the wall! You can place outlets almost anywhere: window sills, mantles, in cabinets and islands, and even on the floor. You can also rotate the orientation of an outlet so that the two sockets are next to each other horizontally—this is helpful when you have appliances with bulky plugs. Think about what you need the outlet for. You may be using a mixer almost exclusively on your island, or you may own a pair of vintage lamps that you’ll want to plug into the floor instead of running a wire to the walls. Options for electrical changes during a remodel may be a bit more constrained, but even then you can make some simple upgrades that will completely change how you plug things in. A designer will be able to guide you in placing outlets properly and introduce you to any new trends. Who knew something as simple as an electrical outlet could have so many options! If you’re in the midst of a remodel, or planning one soon, be sure to dedicate a few minutes to electrical outlets. Think about how you use them and what you want them to look like. A simple change to this ordinary home feature could bring you daily joy.